Contains a list of conditions currently considered to be auto immune disorders and a brief description of each with links to more in depth information. Describes symptoms, diagnosis, complications, treatment and research into Sjogren's syndrome. CIDP by an undergraduate class at Davidson College. How minerals affect your health, food sources, RDA and symptoms of deficiency. Pain from NINDS Health material. 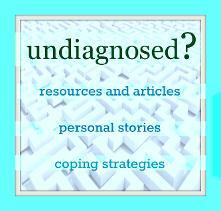 Undiagnosed? Resources and links to help.